In 1829, at the age of 18, my Great Great Grandfather Andrea Callus was part of a wave of Maltese people choosing migration in search of a better life, who went to Constantinople in Turkey. He was born in Zebbug in Malta in 1811 into a fairly affluent family. His father Joseph was the owner of a large cotton spinning mill but in 1813, disaster struck Malta in the form of an outbreak of bubonic plague which claimed the life of his father while he was still a toddler. In the years that followed, the economy went into a sharp decline and the cotton industry all but vanished. Many people went to North Africa but a sizable number chose to go to Constantinople (Istanbul) and Smyrna (Izmir), both then part of the Ottoman Empire. When Andrea arrived, he was not alone. A casual glance through the parish registers of the Latin RC churches throws up many Maltese surnames; Azzopardi, Buttigieg, Borg, Calleja, Cassar, Gristi, Pace, Spitero, and many more. Other Calluses crop up, such as Antonio Callus and Francesca Ascathari who married in Constantinople in 1831. It is possible therefore that this couple migrated at the same time as my ancestor and may even have been related to him. At its peak, the Maltese community in Constantinople was thought to number around 4000. Another sizable colony lived in the port city of Smyrna (Izmir). This is where the other half of my Maltese ancestry came from, as around the same time, the family of my Great Great Grandmother Marie Anne Griscti, also migrated to Turkey, while she was still a baby. 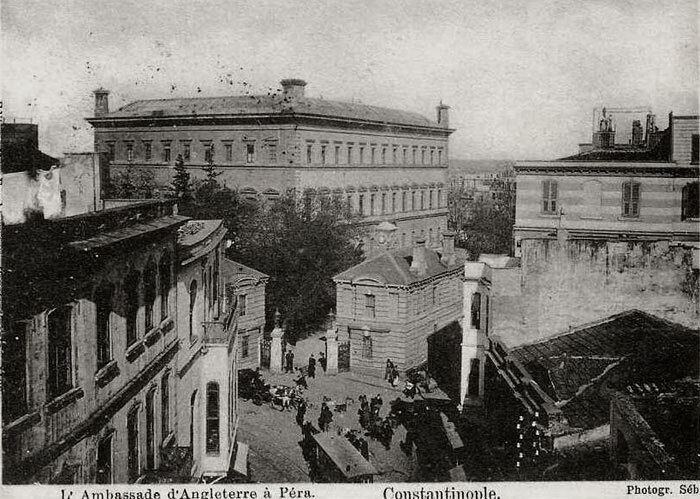 In this post I shall focus on the origins and development of the Maltese community in Constantinople in the first half of the nineteenth century; who they were, how and where they lived and how they related to the other communities around them. I will write about the Smyrniot Maltese community in a future post. 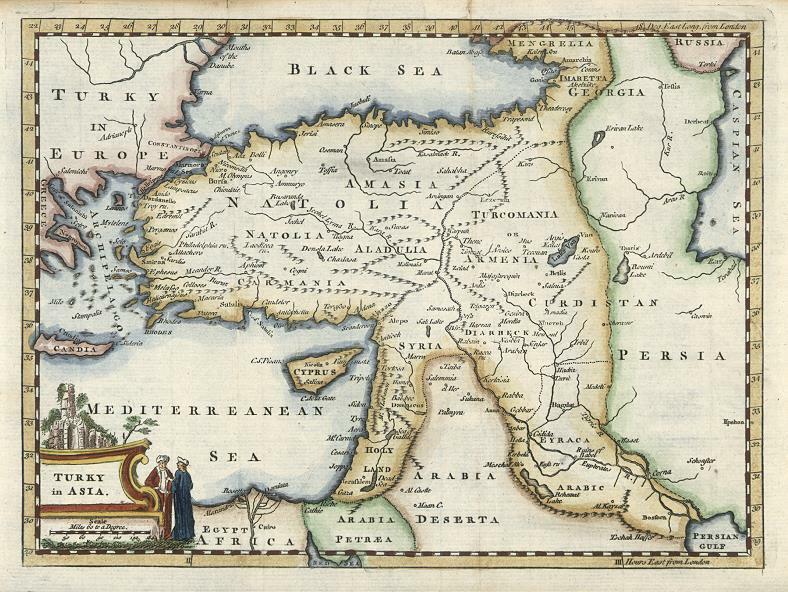 Map of the parts of Europe and Asia adjacent to Constantinople (1781). It might seem strange that so many Maltese would choose to migrate to the territories of their historical arch enemy, the Turks. In truth there were probably always a number of Maltese seafarers in transit around the ports at Constantinople and Smyrna, but because Malta’s rulers, the Knights of St John (Knights Hospitallers), never made peace with the Ottomans, very few settled there. Indeed they would not have been welcome as the Maltese, under the Knights, were heavily engaged in piracy all around the Aegean (Borg, A.). If any muslims were found on ships they boarded they could expect to be sold into slavery by the Maltese corsairs (although this was a fate that was reciprocated). Unsurprisingly, the Maltese were considered unruly ruffians by the Ottoman Turks, a reputation which proved hard to shake off all along the Eastern seaboard of the Mediterranean as far as Egypt and as late as the early twentieth century. The few Maltese that did live in Turkey may well therefore, have had good reason not to want to return home. 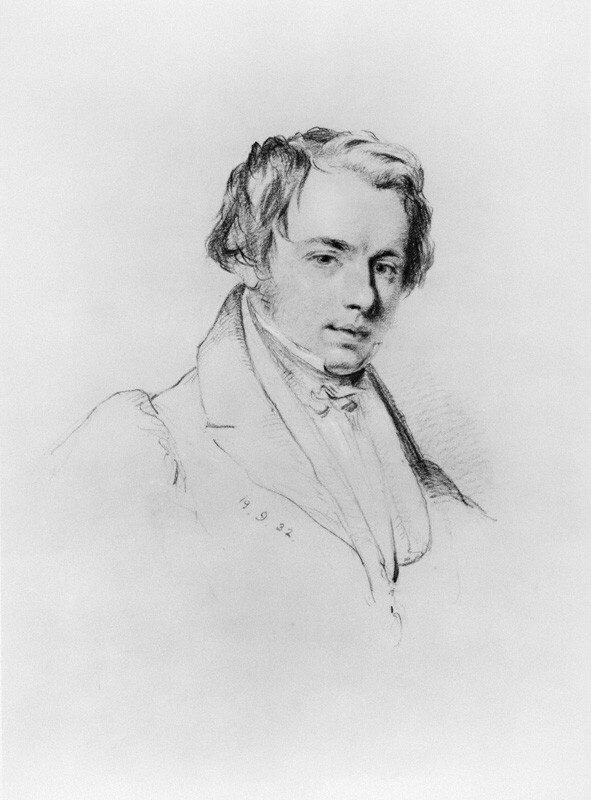 The Scottish traveler Charles MacFarlane visited Smyrna and Constantinople in 1828 and wrote extensively of his trip. He made several remarks about the quarrelsome and disreputable behaviour of the Maltese lower orders who he also feared were not to be trusted after dark! In fact, so bad was their reputation that the local governor or bey of Galata arranged for several hundred Maltese and Ionians (who were considered just as bad) to be rounded up and summarily shipped off to the Dardanelles. The bey got into trouble however, when a prominent Ionian doctor got caught up in the sweep and complained to the British Consul who then waded in to the rescue (MacFarlane, 1829)! The make up of Maltese residents probably only started to change when Malta became part of the British Empire in 1814, because Britain, as one of the western states granted “capitulations” by the Sultan, had a completely different relationship with the Ottoman Empire. Constantinople has always been one of the great cultural melting pots of the world. The city was founded as a Greek colony in about the 7th century BC, then became the capital of the christian Byzantine Empire under Constantine the Great in 324 AD when it was known as Byzantium. The Byzantine period continued virtually unbroken until the city was captured by the Ottoman Turks in 1453 under Mehmed II (the Conquerer). In the final years however the Byzantines lost most of their territories outside the city and trade was taken over by the Venetians and Genoese (Mansel, 1995). After the conquest, the sultan built his palace at Topkapi and his administration, known as the Sublime Porte, in Stamboul (also known as Sultanahmet). This is the area most visited by tourists today and is where you will also find the Blue Mosque, Haghia Sophia and the Grand Bazaar. The European side of the city is however, dissected by an inlet called the Golden Horn. On the opposite side of the Golden Horn lie the districts of Galata and Pera, where the majority of Christians who stayed on after the conquest lived. This included the semi-independent colony of Genoese traders who became established in Constantinople in the 13th century. Their base was the triangle of land at the entrance to the Golden Horn, enclosed by thick protective walls and the eponymous Galata Tower which was built in 1349. Although the galatian Genoese had long been allies of the Ottomans, they did actually fight against them during the conquest. Despite this the Sultan recognised the prosperity they brought into the city so allowed them to stay on under his protection as long as they swore loyalty and paid a poll tax. 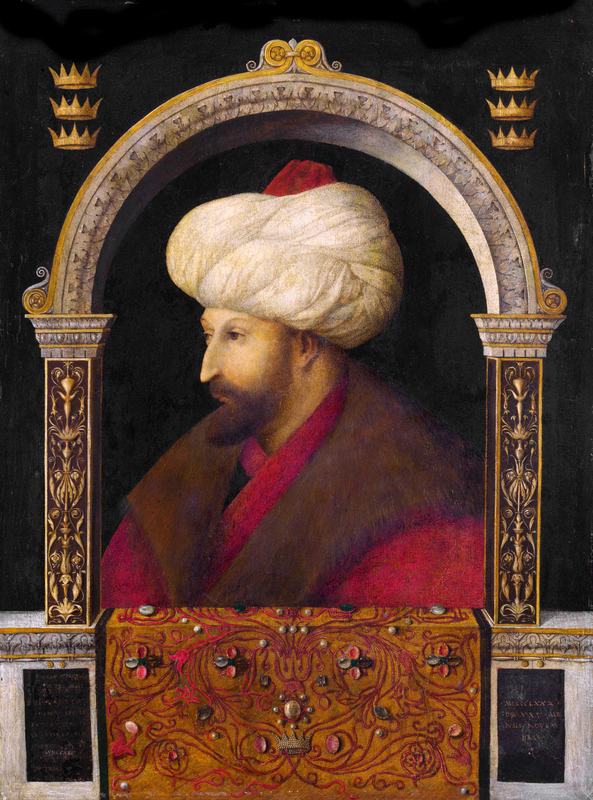 The sultan’s indulgence was also partly motivated by the knowledge that the Venetian navy was more powerful than his, so having a resident community of Italian seafarers provided some additional protection (Mansel, 1995)! The map below looks out across the Bosphorus from the Asian side of Constantinople to the European side. The water on the left is the Sea of Marmara, the land in the middle is Stamboul. The Golden Horn is the water inlet on the right and the land to the right of it is Galata (surrounded by its walls) and beyond is Pera (Pera means beyond)! As early as the 15th century the Ottomans opened up new trading opportunities to westerners in the form of capitulations (or chapters). 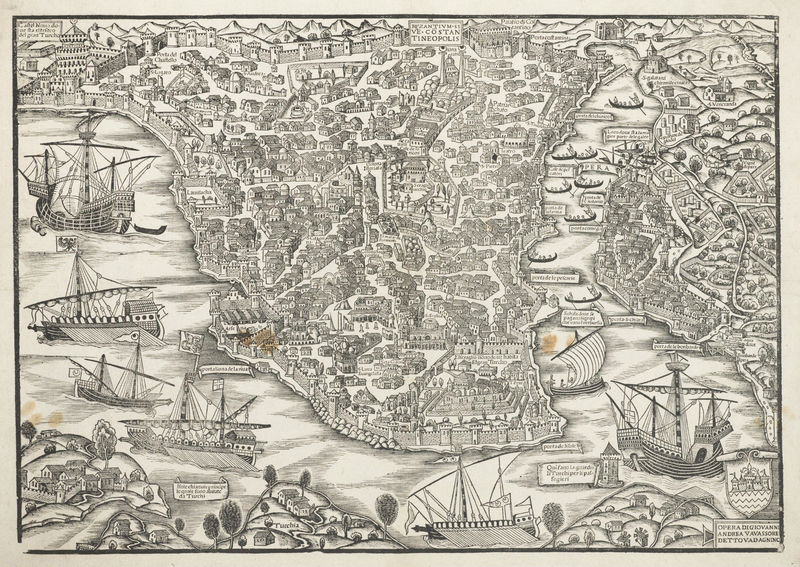 The first state to be granted capitulations with the Turks was Venice in 1454. France followed in 1569 and England in 1581. They were gradually joined by other countries such as Italy, Netherlands, Sweden, Denmark and Poland (Mansel, 1995 & 2012). The terms of the capitulations granted each state the right to trade freely and to manage their affairs according to the laws of their home nations. This meant that British people who wished to settle in Turkey lived under the jurisdiction of the British Consul. They were exempt from local taxes, were governed by British law and could freely practice their religion. The arrangement was mutually agreeable to the administrative powers in that it provided powerful incentives for traders and entrepreneurs while making things less comfortable for the undesirable elements and runaways from the home countries! 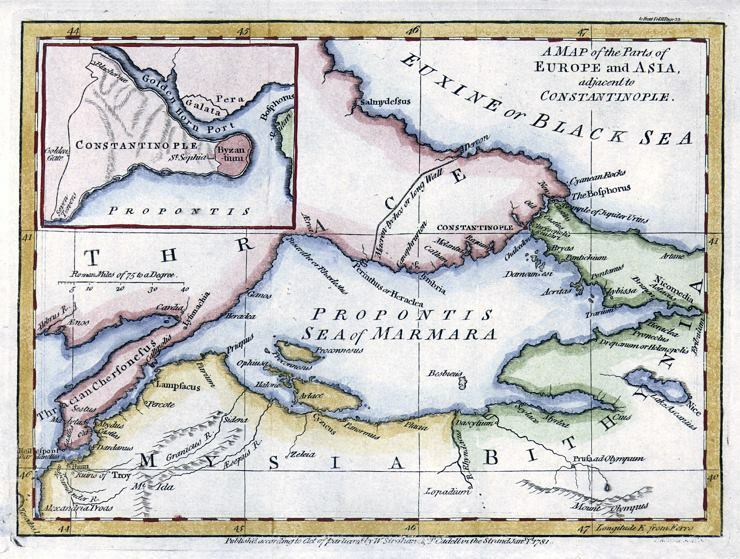 In time these settlers formed a distinct cosmopolitan sub-culture that came to be known as the ‘Levantines’, from the French levant meaning ‘rising in the East.’ Often coming from the better off and more educated classes, a key feature of Levantine society was the niche position it acquired in the development of trade between East and West. Up until the 1840s most Levantines spoke Italian or Lingua Franca, (i.e. a simplified version of Italian with ‘loan words’ from other languages widely used around the port cities of the Med. ), then French became the dominant language. However the Levantines were also renowned as a polyglot community, most people speaking at least 4 or 5 languages including Greek, Italian, French, Hebrew and English and many also conversant in others such as Turkish, Persian, Armenian and Serbo-croat. This made them useful as go-betweens in the ports and trading districts where they worked as interpreters (dragomen), negotiators, shipping agents, merchants, bankers and so on. Working between Turkish officials, local and incoming traders and travelers, they often profited from both parties in the exchange. It was precisely these types of roles however, that meant they were perceived as not properly belonging to either East or West. This is typified by the way that visiting compatriots referred to them as ‘Franks’ and worried that their dependency on these middle men meant they might be cheated, while the Turks called them ‘Giaours’, meaning infidels. Many Turks quietly resented the Levantines because they felt that the terms of the capitulations were overly generous to the outsiders! As a result the many different ethnic communities making up the Levantines welded themselves into a single multi-cultural sub-group that looked out for each other, while at the same time looked inwards in terms of passionately preserving their own particular cultural identities and traditions. 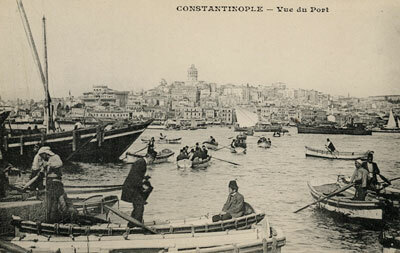 Port of Galata, Constantinople. Source: Levantine Heritage Foundation. The new Maltese migrants were part of this milieu. 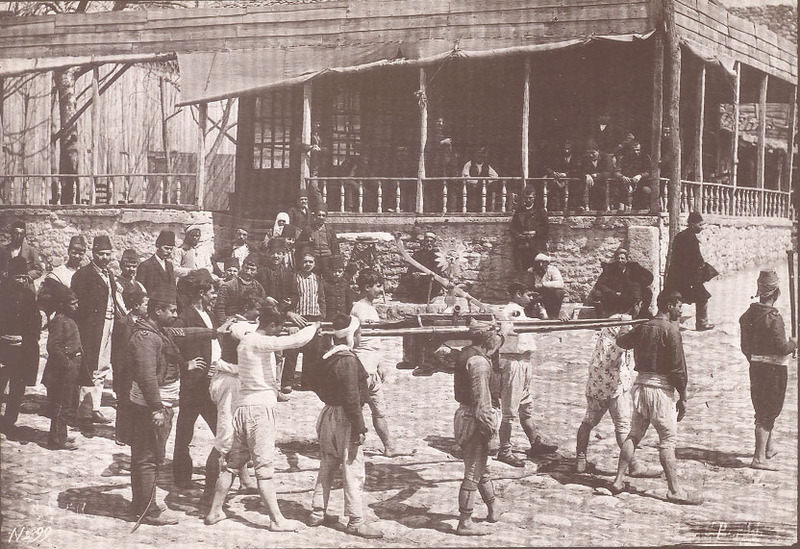 Although there were many Maltese working as sailors and dockers in Constantinople and Smyrna in the first half of the nineteenth century, increasingly others from the merchant and educated classes started to arrive and establish themselves in the Levantine trades and professions. They included doctors, lawyers, writers and artists and small business entrepreneurs such as my Great Great Grandfather Andrea, who set up business as a ship chandler in the Galata district. By the mid 1800s he and many others were well established and successful. For instance, some of his Maltese relatives included Emmanuel Griscti, his brother in law, who owned a forge in Galata and his wife’s cousin, Antonio Griscti, who also owned a chandlers. Andrea’s daughter Elise, married Joseph Calleja, whose family also originated from Malta. Joseph and his brother Antoine worked for the Imperial Ottoman Bank which was based in Galata. Meanwhile Joseph Callos (sic, possibly related), was an importer/exporter of window glass. Unusually, his business was based in Stamboul in Eminonu (near the Spice Bazaar) and he lived in Pera. Prominent examples of Maltese Levantines included Lewis Mizzi, a polyglot of a dozen languages who was the owner and editor of two newspapers; ‘The Levant Herald’, and the ‘Eastern Express’. 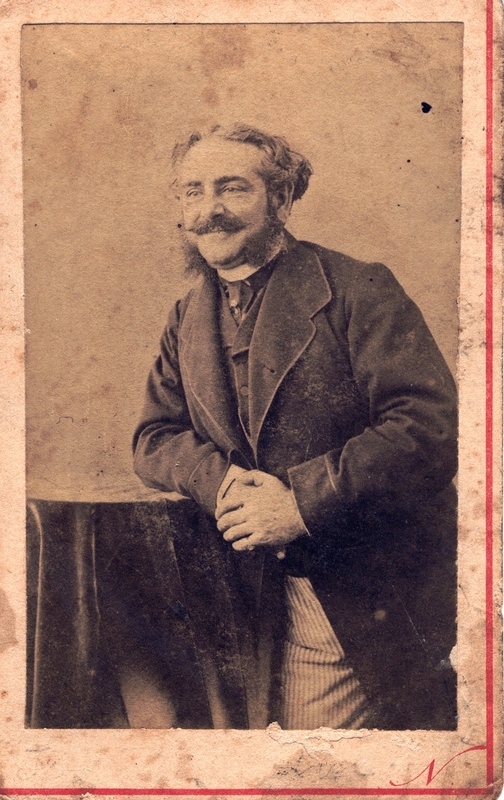 Mizzi became a famous lawyer in Constantinople in the 1870s, but he was also a scientist and minerologist. When he retired, he returned to Malta, where he became a member of Lord Strickland’s political party. Count Amedeo Preziosi. Nadar 1860-70. Public Domain. There was also a famous artist, Count Amedeo Preziosi. Born into a noble family in Malta in 1816 he moved to Constantinople in about 1842 at a time when “orientalism” was becoming fashionable, after studying art in Paris. He became famous for his romantic portrayal of oriental scenes in watercolour or pen and ink which were popular with travelers wanting souvenirs. As a typical Levantine, he spoke Turkish, Greek, English, French and Italian and worked for a time as a dragoman as well as a painter. He married a Greek and had 4 children. His studio was in Hamalbasi, opposite the British embassy in Pera but in later years he moved to the quieter district of San Stefano (Yesilkoy). He died in 1882 after a hunting expedition when his rifle accidentally discharged, spraying him in the chest with shrapnel, as he handed the gun to a servant. He is buried in the catholic cemetery in Yesilkoy. 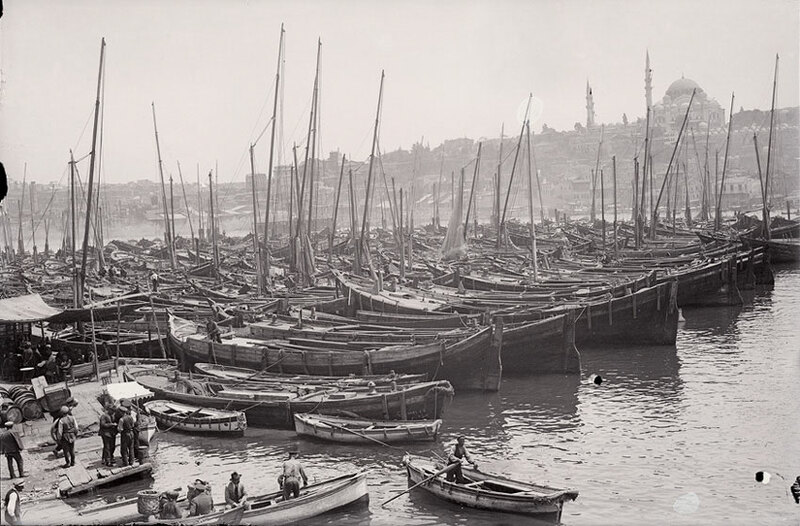 Galata (today called Karakoy), accommodated the larger part of the Levantine trading and working community down at the port. New Quay, Galata. Image c/o LHF. Until 1836, there was no bridge across the Golden Horn so local boatmen ferried people to and fro in small boats. The consequence of this was that most of the inhabitants each side tended to stay put, only crossing when needed so there was a limited amount of intermingling and certainly no socialising between the muslim and christian communities. The first bridge was built in 1836 a little way upstream from the current bridge. 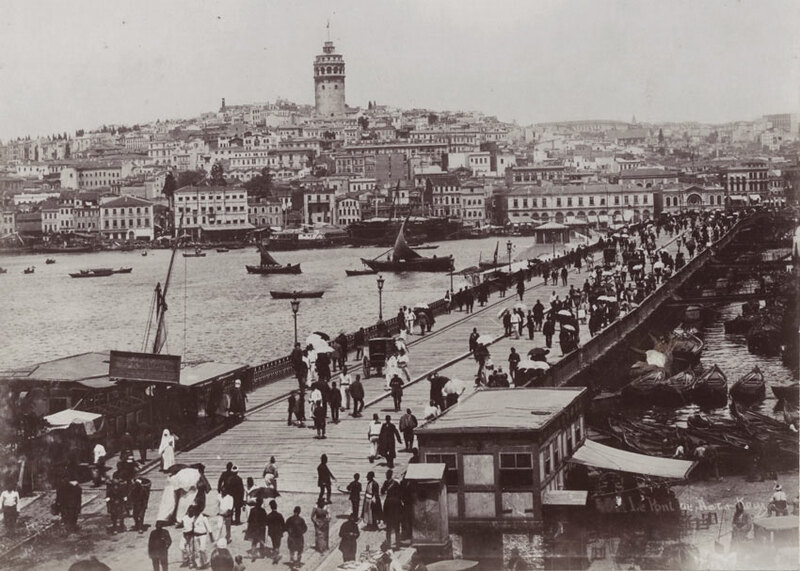 The second bridge was commissioned in 1845 by Sultan Abdulmecid’s mother, the Valide Sultan, and crossed at the mouth of the Golden Horn in the same location as today’s. It has been rebuilt several times since. View across to Galata from Stamboul side of bridge. Source: LHF. 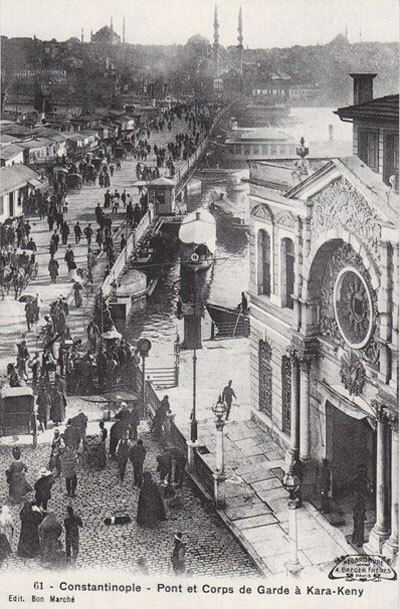 Galata Bridge view pre 1894 with original police station building on the right. Source: LHF. Rue Karakeuy, Galata. Source: Levantine Heritage Foundation. Julie Pardoe, writing in 1839, observed that Galata was a prosperous enclave, being the focus of European commerce in Constantinople. The Camondo Palace on the shore of the Golden Horn. It is now owned by the Turkish Navy. An example of one of these “principal Frank merchants” was the Jewish banker Abraham Soloman Camondo. He was the main banker for the Ottoman Empire until the formation of the Imperial Ottoman Bank in 1863 and was fabulously wealthy, owning much property in Galata and Pera. 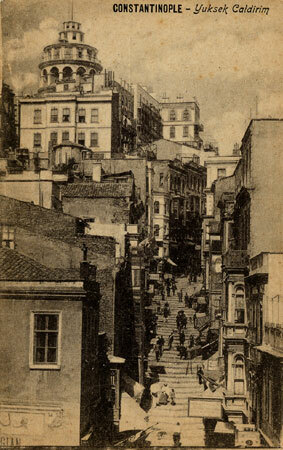 Abraham also built the Camondo steps in Galata c. 1870-80. 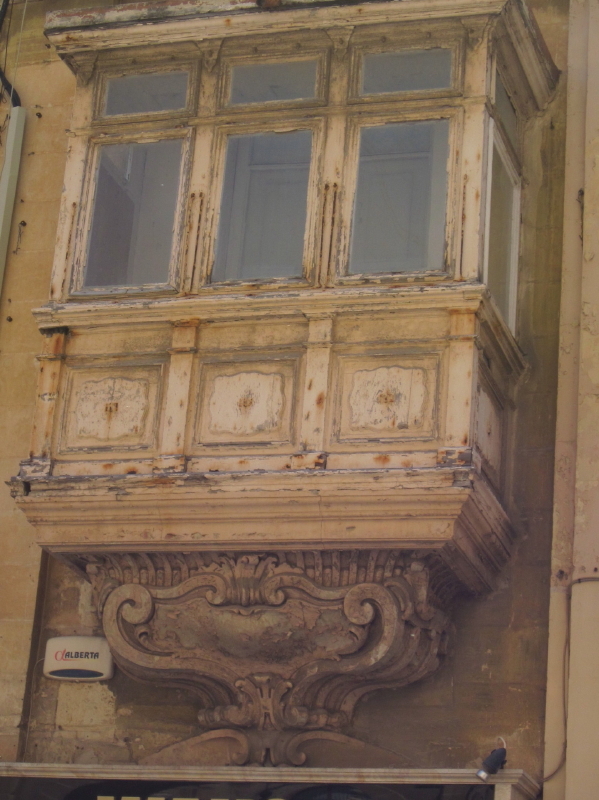 Typical balcony of Valletta, Malta. Image c/o V. Leeming 2015. The Maltese tended to own their own houses and built them in their traditional style, which often featured a style of enclosed balcony very typical in Malta. Maltese balcony in Felek Sok, Galata, Istanbul. Image c/o Maistora. All rights reserved. The example on the left is from Malta. It is thought that this style of balcony originated in Moorish Spain and developed to enable muslim women, who were not allowed outside unaccompanied, to watch what was going on in the streets from a seat in the window. 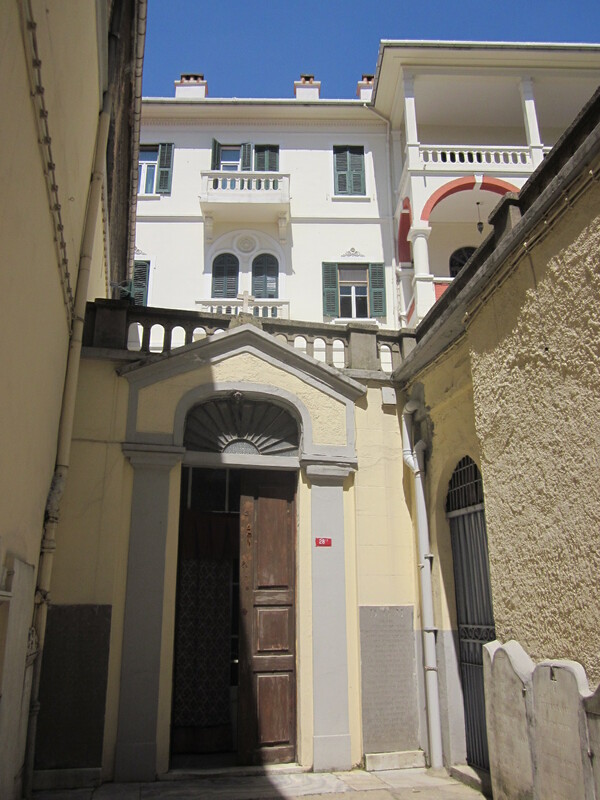 The balcony on the right can be found on Emre Han, Felek Sokak, next door to the former synagogue now known as Schneidertempel Art Centre, just off Bankalar Caddesi in Galata. Other examples can be found all over Galata. This one is unusual in having Maltese cross symbols on each side. 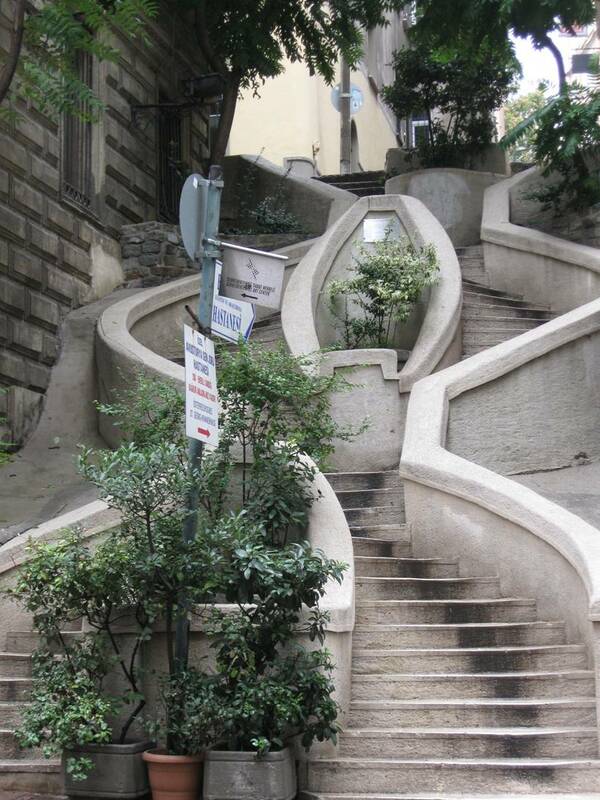 Yuksek Caldirim, Galata (steps up to top of Galata). Undated. Image c/o Maggie Land Blanck. The majority of the population lived up from the Port among the many narrow streets and steep ‘staircases’ lined with houses mostly built of wood. The area was notorious for frequent outbreaks of fire. 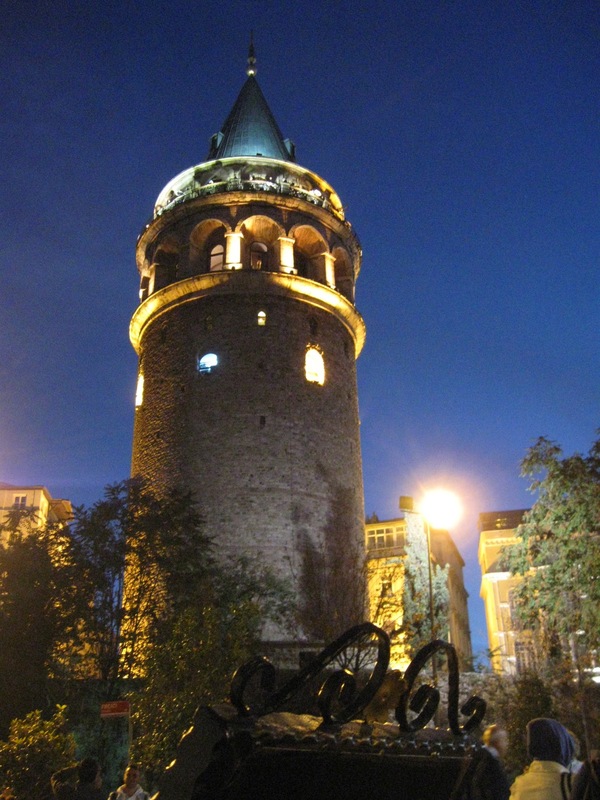 The Galata Tower, at the top of the hill was therefore used as a watchtower for fires. In 1829 MacFarlane observed that this was manned by a guard of two or three men night and day to give the alarm when a fire broke out, which they did by beating a tremendous drum suspended in the upper gallery. Wild fire brigade Istanbul by G Berggren 1835-1920. 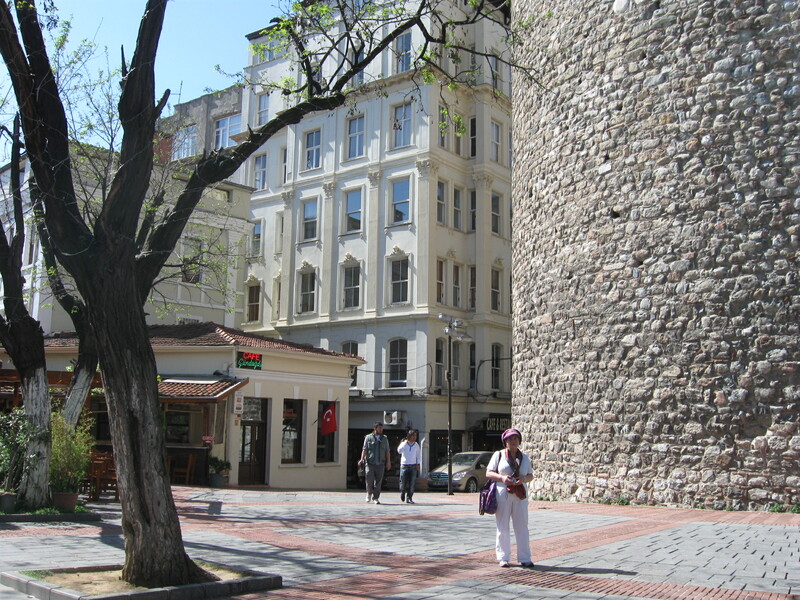 The Galata Tower along with the original medieval walls, marked the boundary between Galata and Pera. However the walls were removed in 1860 in order to enable the development and enlargement of Pera as a fashionable new residential and shopping district for the Levantines. 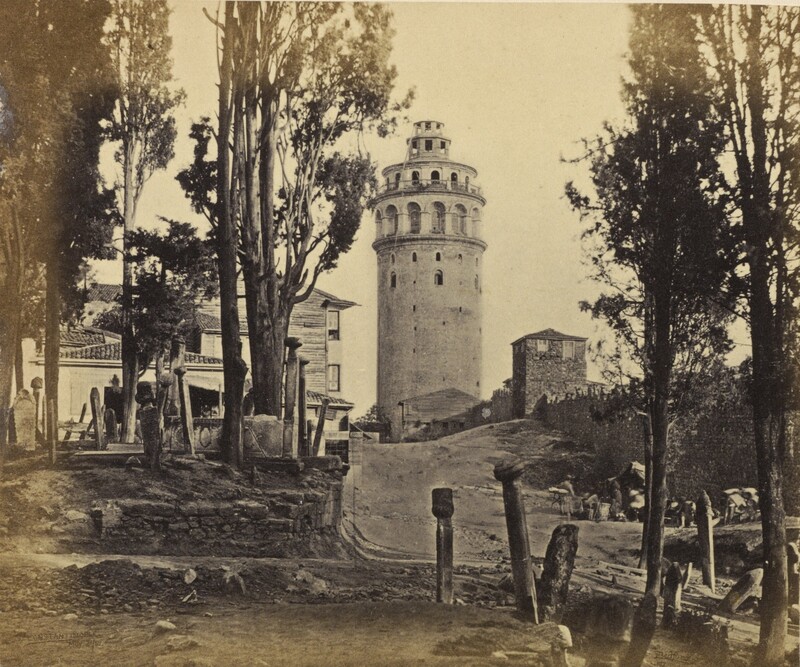 Francis Bedford – Constantinople – Tower of Galata and Portion of a Turkish Cemetery, May 21, 1862. Digital image c/o the Getty’s Open Content Program. Both Pera and Galata were renowned for being over run with packs of feral dogs which prowled the streets and sprawled out in the middle of the roads. At night they kept up a fearful cacophony of barking and howling. The muslim population believed they brought good luck to the city so fed them, but the christians considered them a menace and chased them away or poisoned them. At one point, Sultan Abdulmecid had them all rounded up and shipped off to an island in the Sea of Marmara but there was such an outcry from the Turks that he had to have them all brought back (Mansel, 1995). 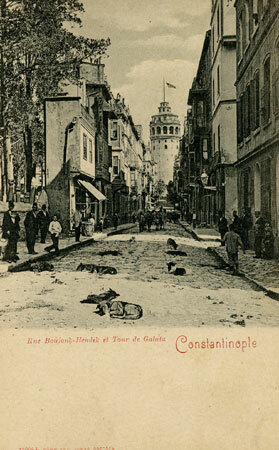 Feral dogs in Rue Boujouk-Hendek, Galata, undated. Image c/o postcard collection of Maggie Land Blanck. 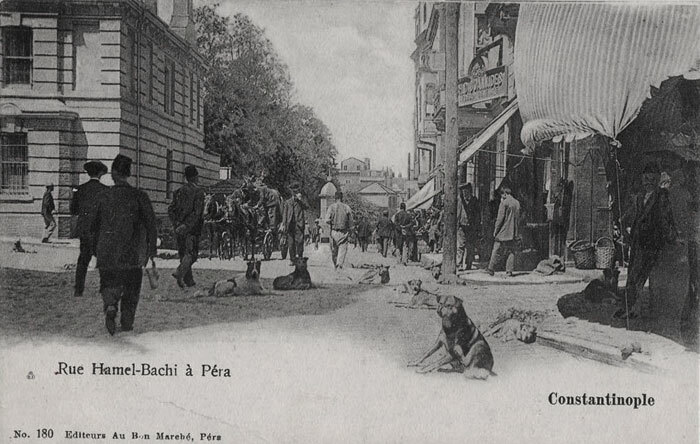 Packs of dogs on Grande Rue de Pera c. 1906 c/o postcard collection Maggie Land Blanck. Dogs on Hamel Bachi, Pera. c/o LHF. The Maltese community were predominantly Roman Catholic and most frequented the parish church of the apostles St Peter and St Paul in Galata. There has been a church on this site since about 1600. The church that stands today was built by the Fossati brothers in the 1840s and is built into part of the remaining medieval Genoese walls. 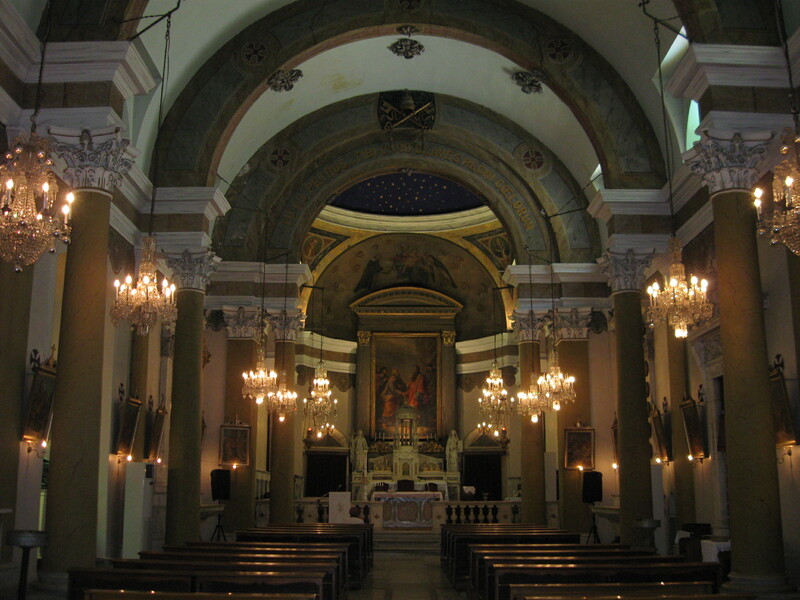 It is still used today by the Maltese community of Istanbul with masses conducted in Italian. 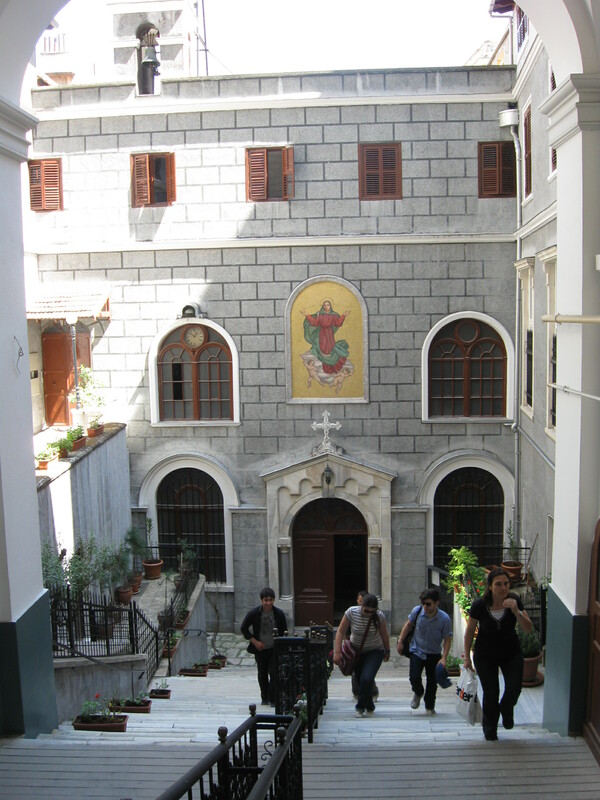 Inner courtyard of S.S. Peter & Paul RC Church in Galata. The Ottoman Empire did not allow Christians to build churches on tops of hills or fronting directly onto the streets. In 1848 Andrea Callus married Marie Ann Griscti at this church. They went on to have 14 children who were all baptised here. Like many Levantines, the Maltese preferred to marry into their own community and marriage was seen very much as a way of cementing alliances with and improving the financial security of families. Romantic unions did occur but were not usually the primary concern. There was a 20 year age difference between Andrea and Marie Ann and it is probably no coincidence that both the Callus and Griscti families ran chandlers businesses. As for deaths, at the other end of the spectrum, the majority of Maltese were interred at Ferikoy cemetery, a few miles north of Pera. There are a few memorial stones within the courtyard of S.S. Peter and Paul, including two Callus’s, and a few burials within the crypt of the church. However most Christian churches simply did not have space for many burials. This memorial to Filomena Callus is one of the tombstones in the courtyard. Filomena was the daughter of Antonio and Francesca Callus who were married at this church in 1831. They may have been related to Andrea Callus. The other church used by the Maltese community was St Mary Draperis in Pera. 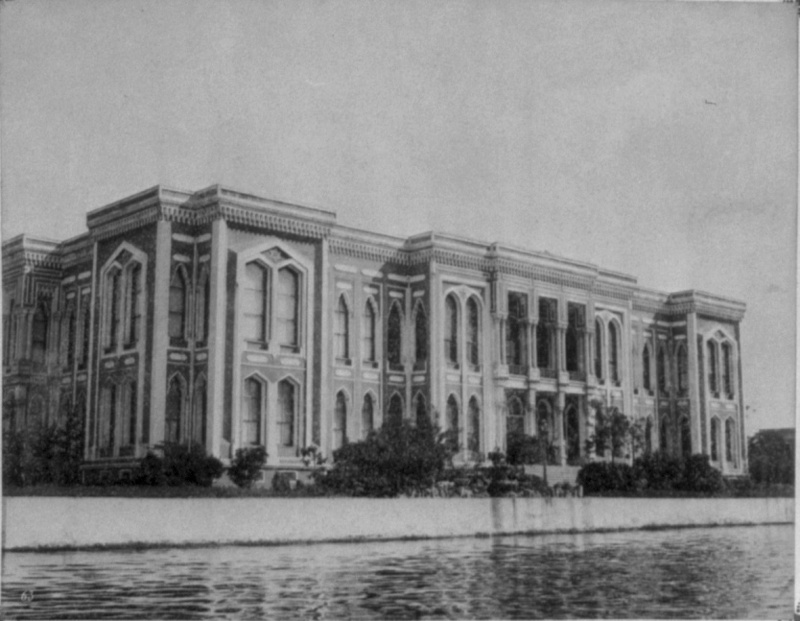 British Embassy Building in Pera. The Levantines who lived in Pera enjoyed a different status. On being granted capitulations, each country established an embassy from which to manage and administer its interests. These were built on the hill behind the port area of Galata in the district known as Pera (in Turkish Beyoglu). In its heyday in the second half of the nineteenth century, Pera became known as the Paris of the East; its main street was called the Grande Rue de Pera and was full of grand and elegant buildings. 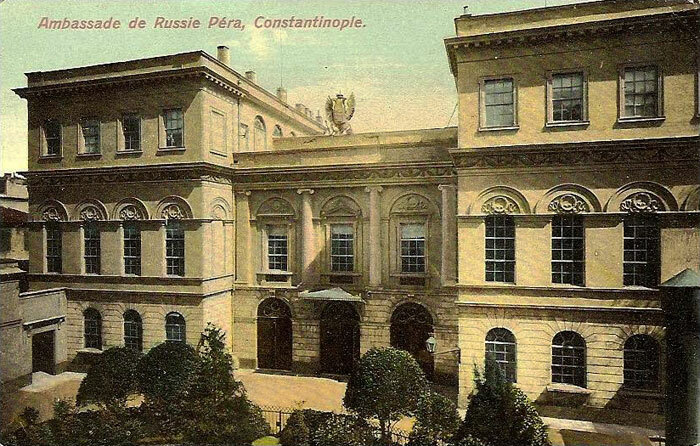 Alongside the embassies were theatres, grand hotels, fashionable shops selling luxury goods, cafes and bars. Pera was therefore considered the aristocratic or more genteel quarter. “a dense grove of gloomy cypresses with crowded white tomb stones glaring from its recesses”. 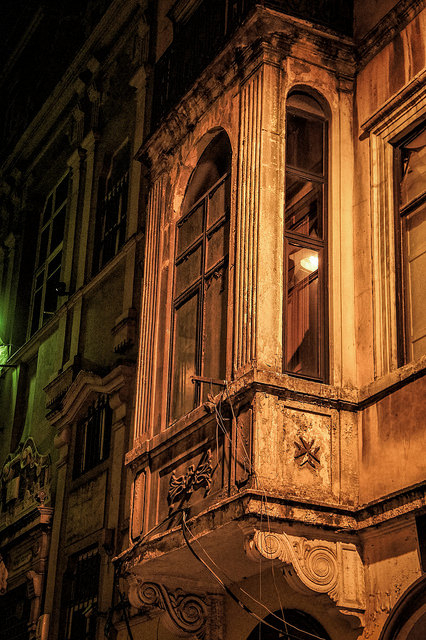 When MacFarlane first climbed the hill up from Galata to Pera he was struck by how quiet the streets were and how sullen and suspicious the inhabitants looked. He also observed with interest that nearly every third doorway was painted red. The reason he discovered was that in January 1828, the Sultan had expelled all the local Armenians, (their persecution in this city something of a prevailing theme in the history of the Ottomans). The red doorways identified their vacated dwellings which were to be appropriated by the Turks. This expulsion followed on from the rounding up of the Maltese and Ionians. The immediate consequence was an almost complete absence of trade and activity in the district. Such acts must surely have caused some disquiet to new arrivals such as Andrea. There was also a prevailing sense of anxiety in the city about a threatened Russian invasion. It could not have been an auspicious start to his new life. As for the higher echelons of society, MacFarlane found the Embassy community lacking culture and living a stultifying life. They rarely ventured out of their grand houses except to visit each other at the occasional soiree and had as little to do with the merchant class Levantines as possible. Even so, any self respecting Levantine trader who wanted to show off their rising social status and wealth did so by moving house up the hill! The further up into Pera you went, the higher your social status! Petraki Han opposite the Galata Tower. Built in the 1890s and home to Andrea and Marie Ann Callus. As for my great great grandfather, by 1898, he was living with his family in an apartment in Petraki Han, a large, new and fashionable neo-classical style apartment block right opposite the Galata Tower. In true Levantine style, he had made it to the top both topographically and symbolically! 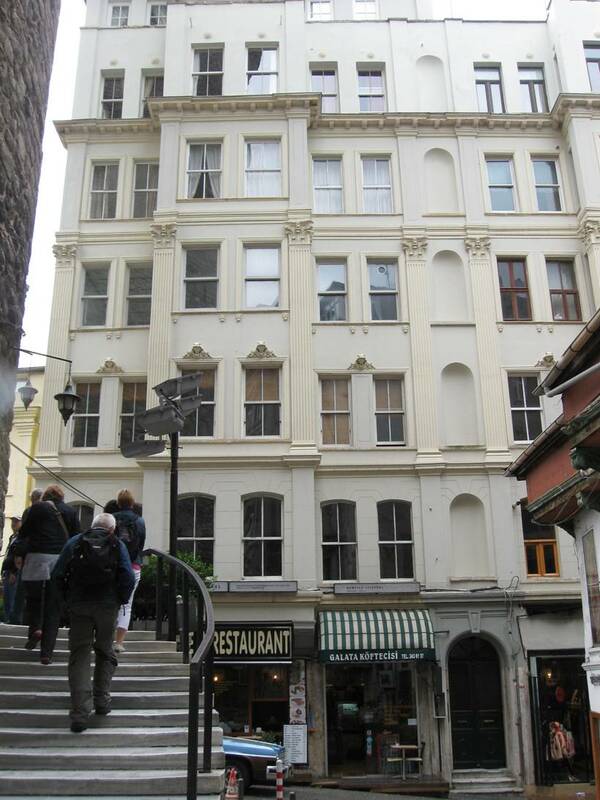 Apartments in this building are today available as holiday lets at Istanbul! Place. One of these “Petraki II” is quite possibly the actual apartment of my forebears! 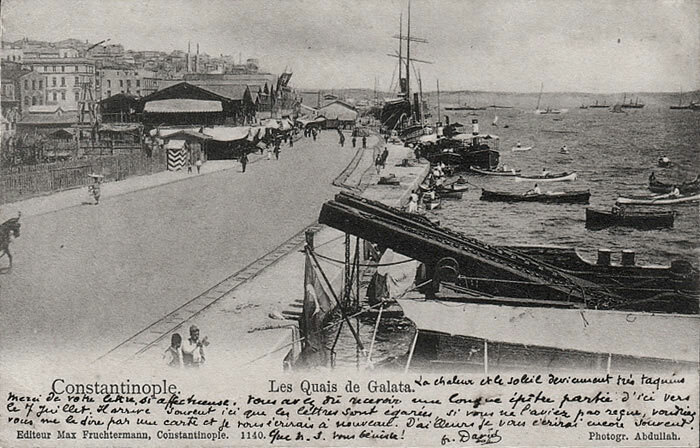 In a future post, I will return to the subject of life in Galata and Pera in the latter half of the nineteenth century with more details about my Maltese ancestors and their families and associates. For my next post I will discuss the life of the Maltese Levantines who lived in Smyrna, another Turkish port city south of Constantinople on the Aegean coast, which had quite a different aspect and culture. Borg, Alexander, From Sworn Enemies to Fellow EU Applicants: Contradictions, similarities and differences between Maltese and Turkish Societies. Pardoe, Julie, (1839), The Beauties of the Bosphorous, London. Uncredited images are the author’s own. 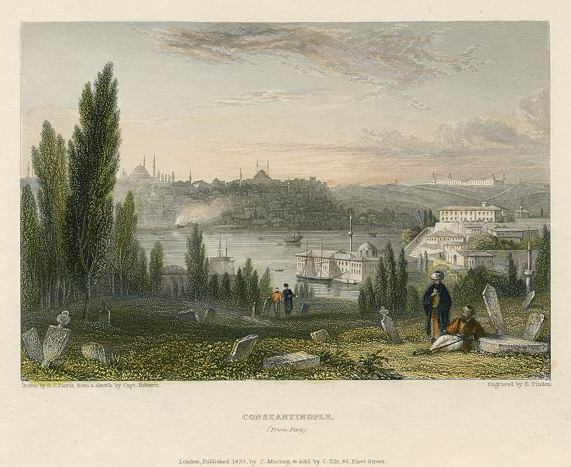 This entry was posted in Callus, Constantinople, Griscti, Maltese Levantines and tagged Amedeo Preziosi, Andrea Callus, Antonio Griscti, Charles MacFarlane, Emmanuel Griscti, Ferikoy Cemetery, Galata, Galata tower, Griscti genealogy, Gristi, Istanbul! Place, Joseph Calleja, Karakoy, Levantine, Levantine heritage, Lewis Mizzi, Maltese balconies, Maltese migration, Ottoman capitulations, Pera Istanbul, Petraki Han. Bookmark the permalink. Angela. Thank you so much for an extremely interesting article which I very much enjoyed. You must have done a tremendous amount of research in order to come up with such a very detailed picture. Thank you Adrian. I’m glad you enjoyed reading it. There is much more to come. 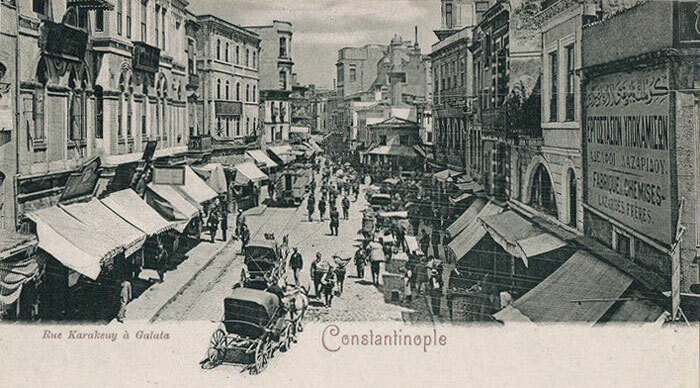 Hi, my family (Buttigieg’s) arrived in Constantinople around 1850’s. My grandparents and parents were married in Ss Peter and Paul’s. My Great grand Uncle Giuseppe married a Caterina Maria Callus. They had 3 children; Antonia 1869), Giovanni 1876) and Filomena (1871). Are they related to you? Thank you for contacting me. How interesting to read your comment. 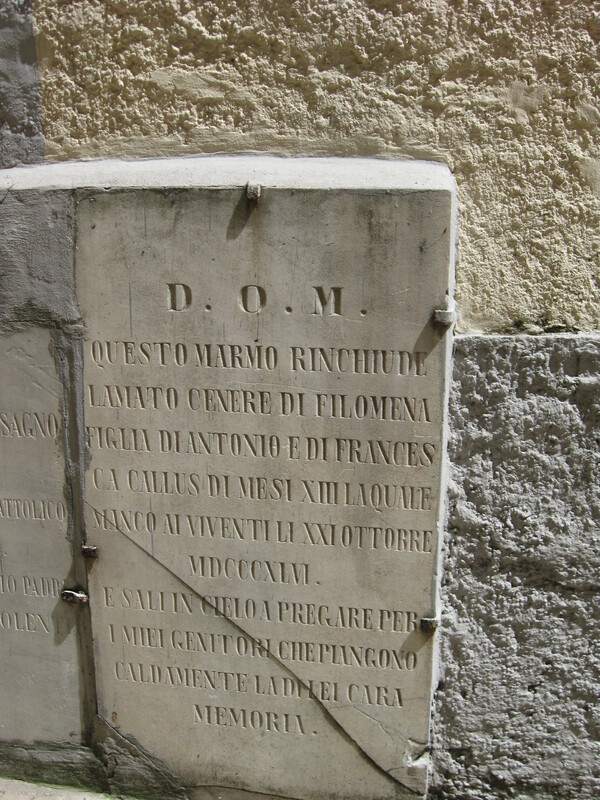 I believe your Caterina Callus was a daughter of Antonio and Francesca, the couple whose memorial to their daughter Philomena is described in my post above in the courtyard of S.S. Peter and Paul! I cannot say at this point if our Callus families are related but I am almost certain that they knew each other. Also my GG Grandmother had an uncle who married Consulata Buttigieg in Constantinople in 1859 so it would be interesting to work out if she was related to Giuseppe. Do you have any more information? Hi Angela, I have a little information about the Callus family who left Constantinople around1940 and went to Cairo, India, Cyprus and Australia. I went to Constantinople 3 years ago and went to Ss Peter and Paul’s church where I got a lot of informaton about my family history. Thank you Julia, I’m so pleased you found it interesting and yes, I would be delighted if you shared print copies in the apartments. Please do get in touch if you find any info to add to this. Thank you for your interesting story Nicholas. I will look out for the names you are researching and maybe other visitors to this site might also be able to help you with your research. It might seem equally (or perhaps more) strange that “Turks”, or Ottomans, would welcome “historical arch enemies” as migrants into their capital city. So it’s possible some retaliatory measures were taken by the Ottoman government.